• King Crimson 2014: Toyah is mentioned in various recent online articles reporting on King Crimson announcing dates for September/October, including Uncut and VVN Music. 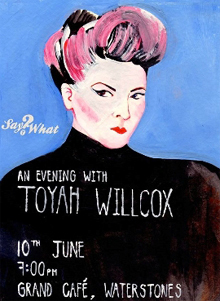 Tickets are now available for Toyah talking at the event Inspiration and the Blank Page, with Helen David, part of SohoCreate. The inspiration is the easy bit, turning it into something worth spending a chunk of our life working on is the challenge. How do we fan the creative flames to bring the tiny spark into a real idea that can build into a project of worth? How do we know which ideas will sustain and which do not have the legs to survive. The risk of committing to a single idea above all others is huge, where does the bravery to make the choice come from? I can’t wait to hear Helen and Toyah talk about what they do when inspiration strikes. 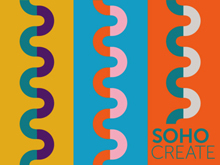 • Book now for Inspiration and the Blank Page with singer Toyah Willcox and designer Helen David at the SohoCreate website. 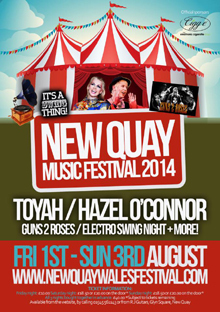 • Toyah Live 2014: View all of Toyah’s confirmed live dates for 2014 at The Official Gigs page. • The Humans US: Toyah and The Humans American adventure is over, for now. She tweeted yesterday: “Portland was AMAZING! Totally won audience over. Even got a round 4 Psychopath vocal……just fab“. A new website for the forthcoming SohoCreate festival is now online. Toyah will be participating and is included in the website’s “All Speakers” section. Click below to visit. 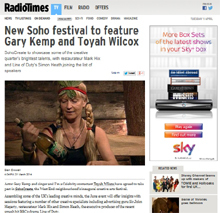 Actor Gary Kemp and singer and I’m a Celebrity contestant Toyah Willcox have agreed to take part in SohoCreate, the West End neighbourhood’s inaugural creative arts festival. Assembling some of the UK’s leading creative minds, the June event will offer insights with sessions featuring a number of other creative specialists . • Continue reading at the Radio Times.